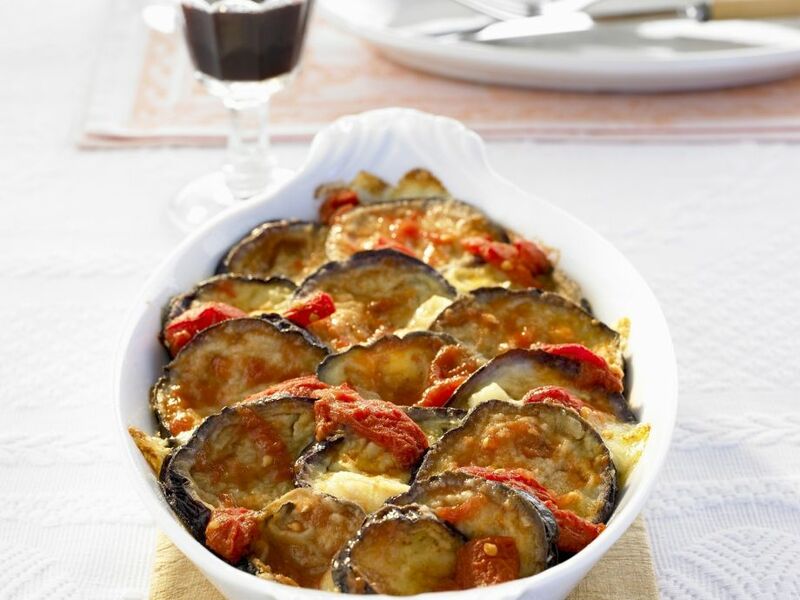 Tomato and Eggplant Gratin - Do you love Mediterranean cuisine? Then you should try this gratin! 1 Rinse eggplant, trim, cut into slices, season with salt and let stand for about 30 minutes to draw out water. 2 Meanwhile, blanch tomatoes in boiling water, rinse in cold water, peel and quarter tomatoes and remove seeds. 3 Grate the Gruyère cheese. Whisk milk with eggs and Gruyère cheese and season with salt and pepper. 4 Rinse eggplant and pat dry. Heat oil in a pan. Working in batches, cook eggplant slices over medium heat until golden brown on both sides. Season with salt and pepper. 5 Layer eggplant and tomato slices alternately in a gratin dish. Pour over egg mixture, grate Parmesan over the top and bake in a preheated oven at 200°C (fan oven 180°C; gas mark 3) (approximately 400°F/convection 350°F) until golden brown, about 30 minutes. Serve hot.